The occurrence and distribution of Shigella species in water from the five river catchments in the North West province of South Africa were investigated. Shigella is a Gram-negative, non-motile, facultative anaerobic bacillus that causes shigellosis, an important cause of morbidity and mortality in high-risk populations (such as children, the elderly and immuno-compromised individuals) that depend on river water. A total of 54 water samples collected in winter (April 2007 to July 2007) and summer (December 2007 to March 2008) were cultured on Salmonella-Shigella agar by the spread-plate method. Suspected Shigella isolates obtained were characterised by primary biochemical (Triple Sugar Iron agar and agglutination) and molecular (polymerase chain reactions, PCR) tests. Amplification of the invasion plasmid gene (ipaH) by PCR was done to confirm the presence of Shigella spp. in water. In total, 214 Shigella boydii, 15 Shigella dysenteriae, 11 Shigella flexneri and 2 Shigella sonnei were confirmed by serotyping in both winter and summer samples. The ipaH gene (606 bp) was present in 176 and 49 of the winter and summer isolates, respectively. The presence of Shigella spp. in water was confirmed with over 90% specificity. The need for more effective management of these river catchments and the provision of potable water and sanitation facilities is needed to minimise the occurrence and transmission of water-borne diseases caused by these and other pathogenic bacteria. Incidences of shigellosis outbreaks as a result of poor water quality have been reported throughout the world.16 In Sierra Leone, a dysentery outbreak caused by S. dysenteriae type 1 and S. flexneri was reported in the Moyamba and Koinadugu districts. Reports provided by the Ministry of Health gave a total of 3094 cases of shigellosis with 132 deaths from 6 December 1999 to 16 January 2000.16 In 2003, 379 cases of shigellosis and 23 deaths were reported in Paoua and Bazoum, north-west of Bangui in the Central African Republic.17 In that same year, a cholera outbreak was also reported in Monrovia, Liberia, affecting 1857 people.17 A year later, North Darfur (Sudan) reported a shigellosis outbreak caused by S. dysenteriae type 1, with 1340 cases of bloody diarrhoea and 11 deaths.18 South Africa is no exception, with incidences of diarrhoea outbreaks caused by S. flexneri and S. sonnei reported in the Mpumalanga, Limpopo and Northern Cape provinces.19 While shigellosis outbreaks have not been reported in the North West province, the possibility of such an occurrence cannot be underestimated as other water-borne diseases such as cholera and typhoid have been previously reported.16,20,21 Therefore with no available information of shigellosis outbreaks in the North West province, this study aims to create awareness of the presence of Shigella spp. in river water and preparedness for any potential full-blown disease outbreak. A total of 54 water samples were collected in 500-mL sterile Schott Duran bottles from the major rivers in the Crocodile and Elands, Marico and Molopo, Marico and Hex, Mooi and Vaal, and Harts river catchments in the North West province (Table 1). Water samples were collected from three sites from each river during the months of April 2007 to July 2007 (winter) and December 2007 to March 2008 (summer). Samples were transported to the Microbiology Research Laboratory of the North-West University. Ten-fold serial dilutions of water samples were performed using 2% Buffered Peptone water (Biolab, Merck Diagnostics, South Africa). Aliquots of 1 mL of each dilution were cultured on Salmonella-Shigella agar by the spread-plate method.22 Plates were incubated at 37 ºC for 24 h.13 Suspected isolates were picked from culture plates and subjected to further analysis for the identification and isolation of possible Shigella isolates. All isolates were characterised using Triple Sugar Iron (TSI) agar to test for glucose, sucrose and lactose fermentation. Bergey's manual of systematic bacteriology25 was used as an identification aid. A total of 235 and 287 isolates, for winter and summer respectively, were presumptively identified as Shigella spp. by the TSI agar test and then subjected to serotyping by slide agglutination. Serotyping was done using S. boydii Poly C, C1, C2 and C3; S. dysenteriae Poly A Types 1, 2, 3, 4, 5, 6 and 7; S. sonnei Poly D Phase I and II and S. flexneri Poly B Types I, II, III, IV, V and VI antisera according to the manufacturer's instructions (Davies Diagnostics, Johannesburg, South Africa). Bacterial genomic DNA was extracted as described previously.26 The concentration of the extracted DNA in solution was determined spectrophotometrically (UV Visible spectrophotometer model S-22, Boeco, Germany) at a wavelength of 260 nm and the purity was measured at 280 nm as previously described.27 The integrity of the purified template DNA was assessed by conventional 0.8% (w/v) agarose gel. PCRs were performed in final volumes of 25µL, with a reaction mixture containing 0.2µg/µL of the prepared template DNA, 50 pmol of each oligonucleotide primer, 1X PCR master mix and Dnase-Rnase free distilled water (Inqaba Biotechnological Industries Pty Ltd, Pretoria, South Africa). The primers IpaH-F 5-'CCTTGACCGCCTTTCCGATA-3' and IpaH-R 5'-CAGCCACCCTCTGAGGTACT-3' (Inqaba Biotechnological Industries Pty Ltd, Pretoria, South Africa) were used. The amplifications were performed using a Peltier Thermal Cycler (model PTC-220 DYADTM DNA ENGINE; MJ Research Inc., Waltham, MA, USA) under the PCR conditions described previously.28 PCR-amplified DNA fragments were separated by electrophoresis on 1% agarose. A wide-range molecular weight DNA marker (100-bp ladder, Inqaba Biotechnological Industries Pty Ltd) was used on each gel as the standard. The gels were stained in ethidium bromide (0.1µg/mL) for 2 h. PCR products were visualised using a GeneSnap Bio-Imaging System (SYNGENE model GBOX CHEMI HR) and the images captured using image acquisition software version 6. 08. 04. Based on the TSI agar test, 235 and 287 presumptively positive Shigella isolates were identified for the winter and summer samples, respectively. Among the 235 positive isolates obtained for winter, serological analysis confirmed a total of 168 S. boydii, 11 S. dysenteriae, 9 S. flexneri and 1 S. sonnei. The results indicated the presence of S. boydii and S. dysenteriae in all five catchments, whereas S. flexneri was present in only three catchments and S. sonnei in only one catchment (Table 2). Similarly, of the 287 Shigella isolates identified by the TSI test in the summer samples, serological analysis confirmed the presence of 44 S. boydii, 4 S. dysenteriae, 2 S. flexneri and 1 S. sonnei. The results indicated the presence of S. boydii in all five catchments and S. dysenteriae in two catchments, S. flexneri and S. sonnei were both present in the Mooi and Vaal catchment only (Table 3). The high S. boydii contamination levels in the winter samples in all catchments are of concern. Levels were as high as 88% and 79% in the Harts and Crocodile and Elands catchments, respectively, whilst levels in the other three catchments were between 50% and 74%. For the summer samples, S. boydii contamination levels were highest (34%) in the Mooi and Vaal catchment followed by the Crocodile and Elands catchment (21%). The level in the Harts catchment was 13% while the Mooi and Vaal catchment and the Marico and Hex catchment recorded less than 10% agglutination each. All 189 and 51 isolates confirmed by serotyping to be Shigella spp. for winter and summer seasons, respectively, were subjected to PCR for the detection of the ipaH gene. The ipaH gene (606 bp) was present in 176 of the winter and 49 of the summer isolates. Figure 1 presents the positive results of PCR detection of the ipaH gene for a few of the isolates collected in summer. The PCR confirmed the presence of Shigella in river water and showed 93% and 96% specificity for winter and summer Shigella isolates, respectively. Culture methods have traditionally been used to identify Shigella species; however these methods have proved less effective because they only detect a small fraction of the actual number of shigellosis cases, probably because of a low number of causative organisms, competition from other commensal organisms and changes in the ambient temperature during sample collection.15,29 To optimise the detection rates, we focused on the use of conventional serotyping and PCR typing methods to detect Shigella in river waters. 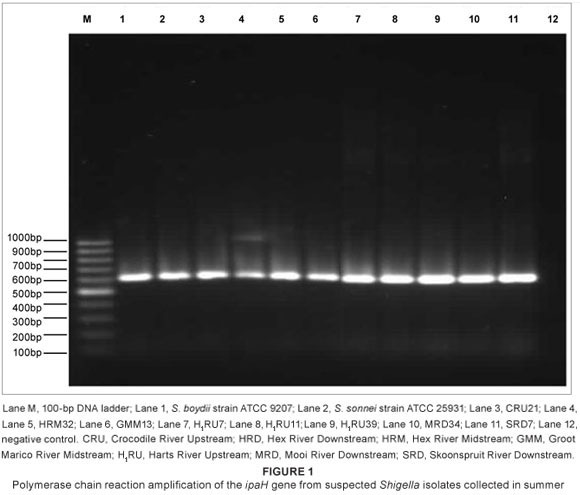 In similar studies, the ipaH gene was used as an indicator to detect the presence of Shigella in environmental waters.23,28,30,31 Although the PCR assay is rapid and highly specific, limitations such as false positives or negatives also exist because of the presence of impurities.31 However, DNA extracted from all suspected isolates and control strains used in the study was checked for the presence of any impurity by measuring the optical density at 280 nm and 260 nm. The ratio of the two optical densities was calculated and compared with that of the standard values, the presence of any impurity was thereby eliminated. The PCR assay used was highly sensitive and the presence of Shigella spp. using 0.2µg/µL of DNA was confirmed with over 90% specificity. Generally, river water harbours a vast majority of enteropathogens derived from municipal sewage discharges, rainfall runoffs from agricultural farms and faecal waste from humans, pets, farm animals and wildlife, because river water is untreated.32 Shigella spp. are sensitive to chlorination at normal levels and can survive for only up to 4 days in river water. In addition, it takes 1 to 2 days to establish a laboratory diagnosis by culture of a patient specimen, making the recovery of Shigella from environmental samples almost impossible.33 However, the findings of this and previous studies2,13 detected Shigella in surface waters and sewage samples, which is an indication that surface waters can possibly transport Shigella strains and that there is a possibility of a continuous source of contamination into the rivers. The detection of Shigella bacteria in the water samples suggests the likelihood of other pathogenic bacteria and confirms the presence of faecal contamination in the river catchments sampled. The presence of Shigella spp. in river water, as demonstrated by this and other studies, is significant and may be of public health concern. The chromosomally located multicopy virulence gene, ipaH, which is also known for its role in producing invasive characteristics, was found in all of the Shigella strains identified. Therefore, PCR screening of environmental samples for the ipaH gene should provide a better indicator of the possible presence of Shigella. We have previously shown37 that river water in the North West province is a possible route of human contamination with pathogenic bacteria such as Shigella, by direct or indirect consumption of river water through its use for recreation, domestic and agricultural purposes. The need for more effective management of these river catchments and the provision of potable water and sanitation facilities is needed to minimise the occurrence and transmission of water-borne diseases.